Holy crow, it’s been hot in Vermont since the Fourth of July. A rare stretch of 90 degree days has inspired me to create meals and snacks that don’t involve indoor cooking. This quick and healthy recipe is courtesy of the leftover watermelon from a Independence Day picnic we had at our house. It was beautifully ripe and sweet, but I could tell it was about to become a bit mushy. What better way than a smoothie to eradicate the texture issue while preserving a sweet flavor? This has a very chilling quality to it, thanks in part to watermelon and mint’s “yin” status, which means they are cooling foods. You can find other great smoothie recipes on the Green Mountain at Fox Run homepage. What do you eat to beat the heat? I am not a fan of the texture of watermelon myself, but I do like the flavor… this recipe seems right up my alley. Especially living in Vegas where we can use that cooling effect almost all year round. 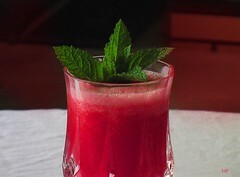 I never would have thought to add mint to watermelon but now that I think of it, it sounds delicious. I live in the Southern Hemisphere so this is a relevant recipe for me right now!